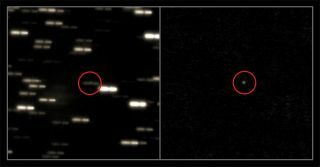 After its long-awaited awakening on Jan. 20, Europe's Rosetta spacecraft resumed its decade-long journey to meet up with the inbound comet 67P/Churyumov-Gerasimenko, which recently re-emerged from behind the sun as seen from our vantage point on Earth. These are the first observations of 67P/Churyumov-Gerasimenko made by the VLT since October. Since then the 4 kilometer-wide comet has increased in brightness by about 50 percent, indicating that its surface ices may have already begun to sublimate into space. Rosetta and its Philae lander are currently awake and doing well after their nearly two-and-a-half year-long hibernation. Launched in March 2004, this May the spacecraft will rendezvous with the comet and enter orbit around it in August. In November, Philae will land on the comet’s nucleus, performing scientific observations as the comet makes its closest approach to the sun in August 2015. Rosetta will be the first mission ever to orbit a comet’s nucleus and land a probe on its surface. It will also be the first spacecraft to fly alongside a comet as it heads towards the inner solar system, watching how a frozen comet is transformed by the warmth of the sun. Read more about the mission here.